Fanboy first paragraph time. I spent a lot of time prior to starting Sekiro preparing myself in two ways. First, I am without a doubt one of the biggest From Software fans out there, with the entire SoulsBorne series of games populating the top of any favorite game list I make. Naturally, I was beyond excited for Sekiro to come out, and once again enter a world of extremely hard, but ultimately fair gameplay. In addition to approaching this game as somewhat of a superfan, I had to approach it as a reviewer. That means that personal feelings have to be set aside in some cases, and a more critical approach has to be taken, where a fan might just overlook something simply because they “love” the game. With all that said, Sekiro is absolutely incredible, and everything I could have asked for as both a fan and a reviewer. First and foremost, this is NOT Dark Souls and this is NOT Bloodborne. While each Souls title makes some subtle changes to stats, changes to parry systems, adjustments to movement and dodging, and so on, Sekiro completely bucks the mold and starts from scratch with something wholly its own. Even the breakout PS4 exclusive hit Bloodborne, while set in a world apart from Souls, held most of the basic mechanics and ideas at heart that made Souls so successful. Sekiro manages to learn from everything that preceded it and build even further, making something beyond special and unique. I found that the only thing my thousands of hours in SoulsBorne games gave me in preparation for Sekiro was a vast pool of patience and willingness to die over and over to learn a boss and how to defeat it. In addition to being mechanically all new, Sekiro has a whole new approach to storytelling. While Souls games are notoriously dense, with the majority of the tale hidden in item descriptions and subtle lore nods here and there, Sekiro lays it out for you with beautiful cutscenes and plentiful dialogue. While I enjoy hunting down information and learning through the world itself, a structured, easy to follow storyline with clearly defined good guys and bad guys, along with set goals was a breath of fresh air that I did not know I wanted. In Sekiro you play the role of a Shinobi, referred to as “The One Armed Wolf”. You are charged with protecting a young lord known as “The Divine Heir”. He is an integral part of the story as things go on, obviously, and after he is kidnapped, your goal is to get him back at any cost. You play a voiced protagonist this time around too, which is completely new. This gives NPC interactions a new level of depth, and adds a lot to the story as well. “The One Armed Wolf” is an apt name, as after losing your arm, you get rescued by the Sculptor who equips you with a new arm, called the “Shinobi Prosthetic”. This is a versatile second arm, serving as a grappling hook, an axe, a shuriken dispenser and much more. This becomes a vital part of your journey through Sekiro, allowing you to traverse the world in ways you could never have dreamed of in Souls, and allowing you to approach combat in new and exciting ways. Upgrade materials and skills can be acquired throughout the game to advance this prosthetic arm and make you even more dangerous, further enhancing combat. Combat is one of the biggest things that Sekiro really makes its own, and probably where the game outshines everything else. If Bloodborne was Dark Souls on speed, Sekiro takes that to a whole new level. Combat is faster and tighter than it has ever been. Each encounter comes down to a series of attacks and deflections between you and your opponent, each trying to break to others posture and land a death blow. There are no builds here, you cannot spec your character a certain way to come back and “cheese” an opponent, there is no ranged option, every fight must be won in a toe to toe battle of skill and timing. Controls are relatively simple, with R1/RB as your attack and L1/LB as your guard. If you guard at the moment an attack lands, you execute a deflection, which prevents you from taking damage and drastically reduces posture damage, while inflicting huge posture damage on your opponent, and typically opening them up for a few hits of your own. After you land a few blows, enemies will typically guard or deflect as well, leading into their own flurry of attacks that must be blocked or deflected. This can go on for 30 seconds to a minute against some foes before one of you ends up posture broken or damaged enough for a deathblow. Every fight is a dance, and every dance ends up with someone dead. This is truly skill based combat at its finest, and in true From Software fashion, it almost always feels fair. There is one specific encounter I can recall, with a rampaging, Flaming Bull, where it felt like no matter when I tried to deflect, I was out of luck. This was honestly the single point of true frustration with Sekiro where I felt that the game was just being hard on me without reason. Every enemy in Sekiro serves to teach you a lesson or increase your skill with a mechanic, and it is entirely possible there is a trick to the Bull that I missed entirely, but looking back on the game, it is the only black spot I can recall. In terms of looking back, Sekiro falls about even between Bloodborne and Dark Souls 3 when it comes to length. If you struggle with the opening hours and mastering the mechanics of combat, you are looking at 30-35 hours of gameplay, while quick mastery of early mechanics and your prosthetic will get you to the end in 25-30. Boss design is quite unique in Sekiro throughout the story, and somewhat sparse. Instead of a big boss at the end of each area, Sekiro challenges you with mid-bosses throughout the entire game, sometimes with 3 or 4 in a row, each bringing its own unique challenge and forcing you to practice a skill that maybe you had neglected up to this point. To foster this spirit of practice and learning, From Software has included an Immortal Swordsman at the Dilapidated Temple, which serves as the hubworld for Sekiro. This is a character that you can approach again and again throughout the game and practice your new mechanics and new prosthetic skills on. After learning a technique, you can enter free combat with the swordsman as many times as you want and practice these techniques without fear of death or damage, as you are invincible in these training sessions. These are incredibly useful training sessions, and everytime I was stuck on a particularly tough enemy, I found myself back at the swordsman practicing my deflection timing and then made my way through the boss like a hot knife through butter. Death is another aspect of Sekiro that will feel familiar, yet very different. Resource and experience collection works very different in Sekiro. Experience is gained from defeating foes and fills an experience bar. Once the bar is full, a skill point is unlocked. Money, called Sen, is also collected from fallen enemies and from coin purses you find in the world. After you die, half of your gained experience and half of your sen is lost. These things can NOT be recovered by returning to the spot of your death. Instead, a mechanic called “Unseen Aid” has a chance of activating and simply saving you from the loss. It is important to note that once an experience point is earned, it cannot be lost. The only experience that you can lose is experience you have earned on your way to the next point. Your chances of receiving Unseen Aid can be tracked from the pause menu (yes, you read that right, since Sekiro is entirely single player, there is now a pause function in game). You start out at 30%, but as you die more and more, a curse called the Dragonrot spreads throughout the land and reduces your chances of receiving Unseen Aid. This can be cured later however, bringing your chances back up to more favorable numbers. Loss is not the only way that death is new in Sekiro. Each time you rest at a Sculptor’s Idol (the Sekiro equivalent of a Bonfire or a Lantern), your resurrection ability is replenished. This is a new mechanic that allows you to chose to resurrect once upon death, coming back to the fight with half of your health bar filled. After resurrecting, you must either defeat a tough enemy or rest at an idol to recharge the ability. If you die while your resurrect ability is on cooldown, you are dead for real, losing your experience and Sen, coming back at the most recent Sculptor’s Idol. Luckily resurrecting does not deprive you of your healing items, so even if you get ganked early in the fight and die without exhausting your heals, you can resurrect and still use those to finish the fight. Healing is done with the help of the healing gourd, a magical gourd that fills with healing water each time you rest at a Sculptor’s Idol. The gourd uses are increased by finding gourd seeds in the world and by defeating tough enemies who hold them. You also have medicinal pellets that can be found or purchased and used to heal, working very similar to Life Gems in Dark Souls 2. When it comes right down to it, Sekiro manages to make a name for itself among the SoulsBorne titles, and yet again come away as something all its own. New battle mechanics, vastly improved movement abilities, a more linear story with much more explanation, all of these serve to set Sekiro apart from the From Software titles that precede it. What could have been a disappointing departure from their tried and true formula ends up being a perfect culmination of all the lessons that were learned before. In stepping away from the normal method of play, but staying true to what makes their games so special, From Software has made a perfect game once again. While more difficult initially, it becomes more approachable and easier the further in you get and the more you adapt to the combat. Since you are not leveling in the same way as the other games, scaling does not work the same way. Once you master the basics, you can master the game. Sekiro is an absolute must buy for From Software fans and anyone willing to put in the work to really get a grasp of the flow of combat. 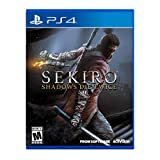 Note: Activision provided us with a Sekiro: Shadows Die Twice code for review purposes.